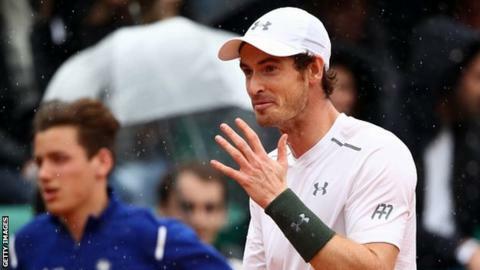 Britain's Andy Murray beat American John Isner in straight sets to reach the quarter-finals of the French Open. The world number two saved three set points in a 16-minute first-set tie-break and was leading 7-6 (11-9) 2-1 when play was stopped because of rain. Murray, 29, outclassed 15th seed Isner after the break to seal a 7-6 (11-9) 6-4 6-3 win in two hours and 40 minutes. The Scot faces France's ninth seed Richard Gasquet, who beat fifth seed Kei Nishikori, in the last eight. Murray, who needed five sets to win his first two matches in France, followed up his emphatic third-round win over Ivo Karlovic with another solid display against a big-serving opponent. The Briton also held his own serve throughout - saving five break points, including three with aces - and finished the match with another ace to maintain his 100% record against Isner. A key moment came in the first set tie-break when Murray saved a set point on Isner's serve by firing a backhand down the line past the advancing American. Murray saved two more before taking the first set and never looked back as he secured his place in the last eight. With more rain expected he will be pleased to have finished the match on Sunday to ensure he has a day off on Monday. "It was a very important tie-break to win. I got lucky on his first set point when I guessed right on a short forehand," said Murray, who has reached the quarter-finals at 19 of the last 20 Grand Slam events he has contested. "I managed to save more set points and it was a bit more comfortable after that." On the effect of the hour-long rain delay, he added: "It is not easy when you're playing and you get stopped at fairly important moments because of the weather. You can't control it and it's easy to get frustrated. "When you're on court you have to try and fight for every single point. But it affects the way the court plays and how you have to play." "Just as he did in last year's Davis Cup clash in Glasgow, Isner threw everything at Murray in the first set, and still came out on the losing side. A gripping tie-break was decided by Isner's forehand error, but only after the American had fought back from 5-2 down and chalked out three set points. "Murray drove Isner to distraction with the drop shot, which he often reached, but could rarely return in court. And when the world number two was under pressure, his intensity never wavered - and his serve remained rock solid. Murray has not been broken in either of the last two rounds, and he looks once again to be a very difficult man to beat. "The rain clouds were in more benign mood than forecast, but may not be so on Monday, when to Murray's relief he won't be one of those worrying about the latest radar picture."